Cafe Barriers – Canvas Colours. 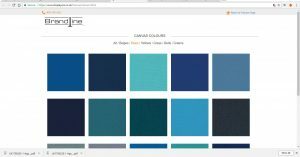 In recent months the number of canvas colours that have become available has increased dramatically. As a leading supplier of cafe banners, we have made things easier for our clients by displaying all of them in one place. We use two main ranges of canvas of our cafe banners. The standard canvas offered for everyday use has the following specification. Tear resistant, mould resistant and of course, UV Resistant. The fabric is guaranteed for 10 years. The second range consists of the same features and attributes, however, has the fire retardant element added. A screen shot of the canvas colour selector. All of the canvas will accept printed media. We have broken things down more by categorising the colours into ranges. At the top of the page the six main colour groups are shown. 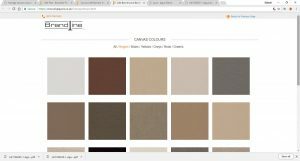 Select a colour group to sort and filter the fabric within that range. The colours are broken down into Beiges, Browns, Reds, Greens, Blues, Yellows and Greys. The canvas colours when filtering blue. 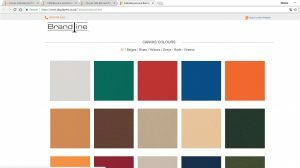 There are over 140 colours currently available in our canvas ranges. More are being added every few weeks. Hover over an image to be given the canvas code. Fire retardant canvas is identified with a FR symbol. Some of the canvas colours are on a slightly longer lead time to others. Call the office for further details. If there happens to be a colour that you require that is not shown, do not worry, just keep your eyes on the website! This entry was posted in Cafe Barriers, Uncategorised and tagged Blue canvas Banners, Canvas Banners. Bookmark the permalink. ← Barrier Rope – Brandline Products Branch Out.